Over the past ten years, Australia has seen steady growth in research and development in Digital Libraries (DLs). The number, size, sophistication and recognition of related projects and initiatives has increased, leading to better funding from government and private organizations. Specific strategies have been put in place to improve Australian skills, expertise and technologies in this field. The aim is to ensure that digital content being developed in the Australian creative, cultural, educational, scientific and academic sectors is accessible in the long term. This requires that it be stored and maintained in digital libraries with robust management and preservation processes. The first phase of DL research began in the mid- to late 1990s with Australian involvement in metadata standards designed to facilitate the discovery of digital resources, ie Dublin Core. The key Australian participants in this work included the National Library (through its Digital Services Project), the National Archives and the Resource Discovery Unit at DSTC in the University of Queensland. The main focus of this work was on metadata input tools and Dublin Core-based search engines. During the late 1990s, this research activity expanded to include metadata standards for multimedia content: images, video, audio and composite multimedia objects. However, it was still primarily focused on support for managing digital collections within libraries, archives and cultural institutions. Funding was ad hoc and fragmented, and a coordinated national effort did not exist. Australian Digital Theses Program Expansion (ADT). These projects focused primarily on traditional scholarly publications and on evaluating existing DL technologies or middleware developed overseas that could be promoted and deployed within Australia. These included DSpace, Fedora and Shibboleth. Although some local refinements and extensions were made, the FRODO projects have not delivered any original DL research. Figure 1: DART's secure annotation system for the collaborative annotation of 3D crystallographic structures. Regional Universities Building Research Infrastructure Collaboratively (RUBRIC). Most of these projects are in an early stage of development, and have not yet produced any substantial results. 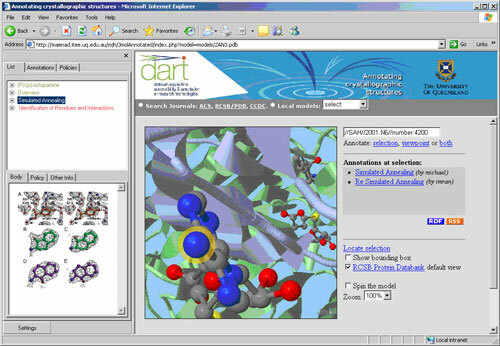 The DART project has, however, developed and demonstrated sophisticated annotation services for communities including protein crystallographers, climate modellers and social scientists. Figure 1 illustrates a screen shot from the secure annotation system developed by the University of Queensland to enable collaborative annotation of 3D crystallographic structures. Apart from the ARIIC-funded projects, there are a number of additional DL research projects being undertaken within Australia that are specifically focusing on preservation. The National Library's PANDORA project is investigating digital preservation technology. In addition, the PANIC project at the University of Queensland is investigating automatic obsolescence detection and notification services, and the application of Semantic Web/GRID services to the discovery of optimum preservation services.